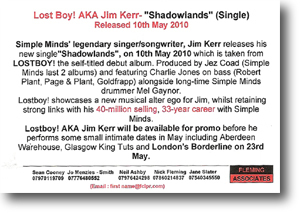 Simple Minds' legendary singer/songwriter, Jim Kerr releases his new single Shadowland, on 10th May 2010 which is taken from Lostboy! the self-titled debut album. Produced by Jez Coad (Simple Minds last two albums) and featuring Charlie Jones on bass (Robert Plant, Page & Plant, Goldfrapp) alongside long-time Simple Minds drummer Mel Gaynor. Lostboy! showcases a new musical alter ego for Jim, whilst retaining strong links with his 40-million selling, 33-year career with Simple Minds. Lostboy! AKA Jim Kerr will be available for promo before he performs some small intimate dates in May including Aberdeen Warehouse, Glasgow Kint Tuts and London's Borderline on 23rd May.